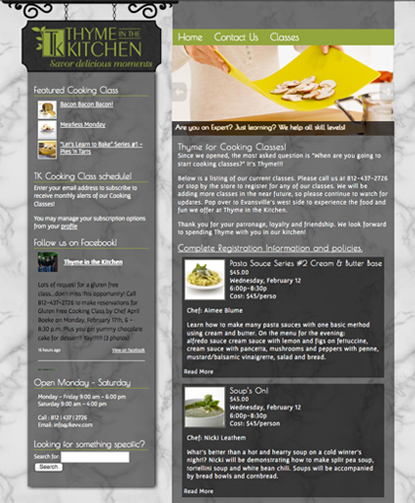 Content Managed Website developed for Thyme in the Kitchen. This kitchen store on Evansvilles’ west side is so unique in products and services I wanted to make certain we captured that ‘One of a Kind’ feel with this custom website design. 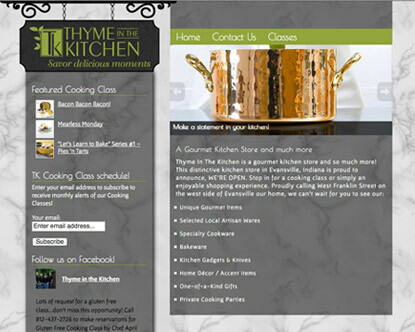 Thyme in the Kitchen offers a wonderful variety of Kitchen and Home Accent products we really wanted the website design to emphasize the cooking classes. 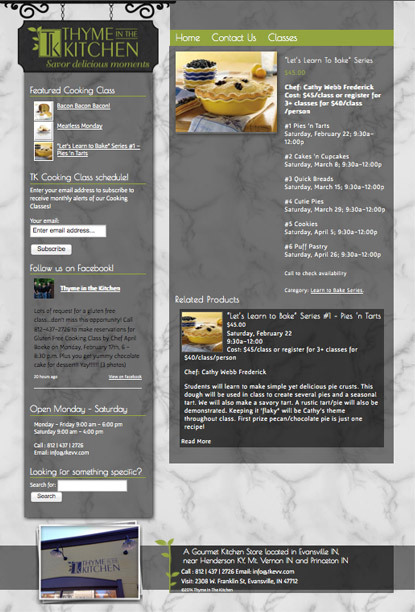 To help Marcia, owner of Thyme in the Kitchen, focus on her store front, I do all of the website maintenance for her. Scheduling and posting all of the classes as well as a monthly newsletter that is sent out to all who sign up at the website and in her west side store in Evansville IN. This allows her to rest assured her website is at it’s peek performance at all times. While the main ‘Cooking Class’ page has the title, price and brief description of each class you can still select a class to see more details as well as any other classes that may be related.